- Does not irritate delicate skin (hypo-allergenic). - Leaves fabric naturally soft with a fresh, clean scent. (Does not require softener). - Effective in removing stains and odours i.e. grease, blood, tar, ketchup, pine sap, red clay, mildew, grass. Skin rash, also known as dermatitis, mean inflammation or irritation of the skin. Symptoms of a skin rash can include reddened, dry, and in some cases, scaly and itchy skin. It may also appear as lumps, bumps or blisters. A type of skin rash that is triggered by substances that irritate the skin such as chemicals, perfumes, soap or detergents. Symptoms include redness, swelling and itching. This reaction usually worsens the longer the skin is in contact with the offending substance. It can be frequently found on the hands and other exposed parts of the body. A rash commonly caused by fragrances or dyes that the skin is allergic (reacting) to. Most diaper rashes are caused by prolonged exposure to wetness and contact with trapped irritants from human waste products, such as bacteria and enzymes present in faeces and ammonia from stale urine. Another trigger factor is the allergic reaction to lingering detergent or softener found in cloth napkins. Don’t take chances. 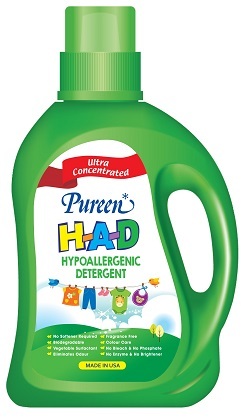 Use Pureen H-A-D Detergent to wash baby’s clothes to prevent skin rashes & allergies. Use Pureen H-A-D Detergent to wash your clothes to prevent skin rashes & allergies. Pureen H-A-D is specially formulated from 100% biodegradable, vegetable surfactant in the U.S.A. for babies’ delicate skin as well as adults’ sensitive skin. Many Healthcare Organizations in the U.S.A. have recommended Pureen H-A-D formula for patients with sensitive skin.